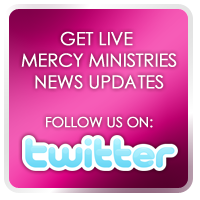 Mercy Ministries News: Friends of Mercy Ministries Across Tennessee Show Their Support!! Friends of Mercy Ministries Across Tennessee Show Their Support!! Tennesseans showed their faithful support for Mercy Ministries once again at the recent Friends of Mercy Luncheons in Nashville and Chattanooga. More than 180 leaders, supporters and friends came to hear incredible stories of healing and transformation and to learn more about how they can help the young women we serve! At the beautiful Chattanooga Golf & Country Club, Mercy Ministries Executive Director of Communications, Eve Annunziato, shared the vision and mission of Mercy. She spoke about how Founder and President, Nancy Alcorn, followed God’s calling to build a home where women can find freedom from life-controlling issues and be restored to wholeness by the unconditional love of Christ. Current Mercy resident, Allie, shared her struggles with perfectionism which led to a severe eating disorder. Since coming to Mercy, she has learned to receive God’s unconditional love and is having her life transformed and her hope restored. 2003 Mercy graduate, Brooke, also shared her story of suffering from severe depression and suicidal thoughts before coming to Mercy. Brooke is now happily married and knows the true freedom and joy that comes from having a relationship with Christ. At the Nashville Mercy home, guests were welcomed by Community Board Member Cherie Hammond. Mercy graduate, Janice, then spoke about how she struggled with feelings of abandonment, rejection and betrayal. Before coming to Mercy, she turned to an eating disorder and several addictions to cope with her pain. Janice, who graduated in December of 2010, is now walking in complete freedom and is excited to be serving in her church’s youth program and sharing hope and freedom with others. Everyone was moved by these inspiring stories of hope and healing. All of these young women are powerful examples of the transformation and freedom that is possible. We are so grateful for the love and support of the Chattanooga and Nashville communities. Special thanks to Chattanooga Patron Sponsor, Coca Cola Consolidated and Luncheon Sponsors, Chattem, and Luken Holdings. Our sincere thanks also to Nashville Event Sponsors, Dan and Cherie Hammond. We are so grateful for all of the table sponsors at each event whose faithful contributions played a critical part in bringing the vision of Mercy Ministries to a wider audience. Your ongoing prayers and donations are greatly appreciated as we continue to expand the vision to see more lives transformed!